Summary: Installing and setting up Simutrans in any language. 2.1. Where do I get it? what should I download? Binary, this is the executable that makes the game run. Choose a binary compatible with the operating system you usually use in your PC. Pakset, this is the set of graphics; there are servera, each one with its own style or topic, so that you can choose. Download both files inside a single folder, for an easy installation. 2.2. Which pakset should I choose? note: Simutrans development is carried out using pak64. You will find development and stable versions at download site. In the case of the previous image, the pak folder may have a different name. It depends on the pak you've downloaded. For example, if you've chosen the pak128, that folder will be called pak128 instead of pak. After placing all in a single folder, locate the executable (exe in windows, elf binary in Linux) that is in simutrans folder and just click on it. Then, will appear the Simutrans loading screen. After the loading screen, will appear several windows. One of them, is language window, where you can choose the game language, if it's supported. Just choose one and click on the button. I am happily playing on PAK64 V102.. Yet I am considering taking part in a forum event that requires Pak128. V102. Can i safely install pak128 without affecting my PAK64 game? Can I easily switch between saved games/different pak sets? Would I need to reboot or anything like that between the two different configurations? You can do everything you have mentioned. Just install the new paksets in Simutrans folder. If you have a look at the image, you'll notice I've installed 5 different paksets: pak, pak128, pak128Motw, pak192comic,, and pakPeluffo folders. Just choose the one you want, and enjoy.. Happens the same with savegames. It doesn't matter if you have savegames from different paksets saved. At savegames window, the game will show the savegame name and the pakset it belongs to. There's no possibility of confusion. Of course, it's obvious you can't play a pak64 savegame if you've choosen pak128 as the pakset you want to play with. There's no cross-compatibility between savegames from different paksets. If you want to play with a different pakset, you'll have to reboot Simutrans. I have never downloaded anything other than pakset64 as I was unsure how it would work and didn't want to lose my current save. This has been most helpful. Can you make a tutorial for mac too please? I don't have the ''Simutrans.exe'' file, Wich is logical, as macs can't open .exe files, but I don't have anything other than things that, well, won't open, some songs and some .txt files. I was making a tutorial on installing games on the Raspberry Pi running Raspbian (Debian)*without* internet access; i.e. grabbing the .deb files and installing manually. However, after manually downloading and copying over simutrans-pak64_111.2-1_all.deb, simutrans-data_111.2.2-1_all.deb and simutrans_111.2.2-1_armhf.deb and installing them in that order using dpkg, the game fails to run (segmentation fault). If I use apt-get to install the game (which defeats my purpose, but I did this to test), the game works fine (runs really well on the Pi). Is there anything I am forgetting, or are the current Debian packages incompatible? Raspberry is very interesting, really ! Which were your solved dependences ? Perhaps don't solve these dependences was the problem , insn't it ? There were no unresolved dependencies as far as I can tell, wouldn't dpkg mention this? It might well be that the dkpg downloads the most recent translations; whithout them simutrans crashes. I downloaded the simutrans zip file, and pakset 64 zip file. 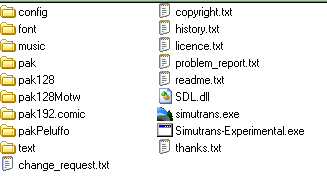 I opened the simutrans zip file and placed the pak folder into the simutrans folder. Tried to open the game, it didn't show. Can anyone guide me step by step in this one? I really want to play the game, being a Chris Sawyer's Locomotion and OpenTTD fan.